Perhaps best known as the director who managed to botch the second Daniel Craig 007 outing ("Quantum of Solace") after "Casino Royale" had reinvigorated the James Bond franchise, Marc Forster does an even worse job at the helm of this ugly, jittery and disjointed endurance exercise. Why some producers persist in thinking that the director of "Finding Neverland," "The Kite Runner" and "Monster's Ball" is a good fit for big action flicks is a genuine mystery. Most of "World War Z" appears to have been shot by hyperactive palsied zombies with short attention spans through green automobile glass. The plot flatlines early, and the anticlimactic ending is embarrassingly unsatisfying. Worst of all, "World War Z" may be the most pointless example of converted-after-filming 3D ever seen on the big screen. There's absolutely nothing about this movie that justifies sitting through it wearing those annoying glasses. The good news is that everyone duped into paying premium ticket prices to witness this dark and dreary disappointment may swear off 3D movies forever, hastening the end of that aggravating and expensive novelty. Brad Pitt stars as Gerry Lane, some sort of United Nations researcher/soldier/secret agent hybrid who has retired to a life of domestic tranquility with his wife and two young daughters. Finding themselves on the run from a stampede of fast, ferocious and very bitey "where'd they come from" zombies, the family is airlifted to an offshore aircraft carrier. For his loved ones to remain safely aboard, Gerry must get back in action to track down information on how to overcome a worldwide zombie pandemic. Aside from the bizarre notion that the best guy qualified for this job is one whose main function lately has been making pancakes at home for the fam every morning, another problem is that a man entrusted with such a vital save-the-world mission is given a ridiculously small support team. With the future of humanity at stake, and the opposition consisting of rampaging hordes of the unstoppable undead, sending Gerry abroad with only a handful of soldiers to back up a doctor who has no firearms experience seems insanely optimistic. There's also the fact that although Gerry has a working satellite phone (so he can check in with his worried wife for the sake of occasional melodrama), he very time-consumingly flies all over the world to interview people he should be contacting instantly by phone or Skype to glean the same information. The movie suffers from some distracting and disturbing political overtones as well. Thanks to "political correctness capitalism," the zombie virus outbreak's patient zero no longer comes from China (as in the novel from which the movie was adapted) but from North Korea (which isn't exactly a big overseas market for Hollywood films). Also, Israel's controversial real-world "security wall" is presented as a prudent reaction to intelligence chatter about a potential zombie threat. But in a have-it-both-ways attempt to soften an allegory that appears to make what some regard as that country's apartheid-style oppression seem pro-actively sensible, the movie also shows Israel generously admitting outsiders to Jerusalem, because "every human being we save is one less zombie to fight." Naturally, it's the joyous singing of those grateful asylum-granted outsiders that attracts a swarm of zombies to breach the wall. Because, you know, a bustling major metropolis otherwise is so imperceptibly quiet that zombies wandering nearby couldn't possibly detect its presence. The cast-of-thousands zombie chase-and-chomp scenes are even more incoherently shot and edited than director Forster's most sloppily assembled "Quantum of Solace" set pieces. Instead of emphasizing the frantic frenzy of high-energy horror, the quick cuts and epileptic shakey-cam shots are simply frustrating and tiresome. A segment at a South Korean airbase that takes place entirely at night looks laughably limbo-set cheap, in contrast to the elaborate cityscape CGI multitudes seen elsewhere. The movie's best special-effects moment is a "Zombies on a Plane" bit in which Gerry realizes there is no better alternative to blowing out the side of a full passenger jet with a grenade in mid-air. Buckle those seatbelts, folks! The ending of the multi-writer screenplay apparently tested so badly that a new one was commissioned and the original footage scrapped. Unfortunately, the new wrap-up's gimmick has too much in common with the similarly unsatisfying last act of "After Earth." 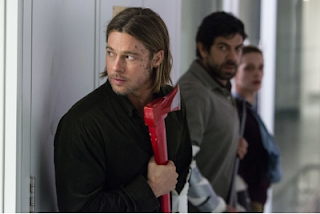 Despite its title, "World War Z" is so invested in its hero's one-man mission that it lacks a truly epic scope. Although Gerry visits three countries and sees at least one mushroom cloud from a plane window, the movie tries so hard to be a "Bourne"-style fact-finding quest that it skimps on the big picture. Yet for a story that's supposed to be so emotionally devastating, what's onscreen often is videogame cold. When Gerry and two cohorts search a research lab where zombies wait patiently around corners to be stimulated into action, the effect is more PlayStation than personal. There's also the fact that nobody in the movie appears to have any compassion whatsoever for the stricken. Seeing their zombified former co-workers at the lab get shot, axed and crowbarred on closed-circuit monitors, the observers may as well be watching flies get swatted. Also, the military-as-government is looking only for a way to vaccinate the population so they have a chance of wiping out the zombies, as opposed to seeking a cure for their less fortunate fellow citizens. A voiceover noting that "this isn't the end, not even close" offers the threat of a sequel, but this brain-dead dud should be left to rest in peace.